9 Examples of Viscosity in Everyday Life? Viscosity is a common observation that the thick liquids like honey and mobile oil, flow slowly than many organic liquids like benzene and toluene etc. It means that different rates of flow of liquids depend upon the certain property and that is viscosity. It is the property which opposes the relative motion of adjacent layers. 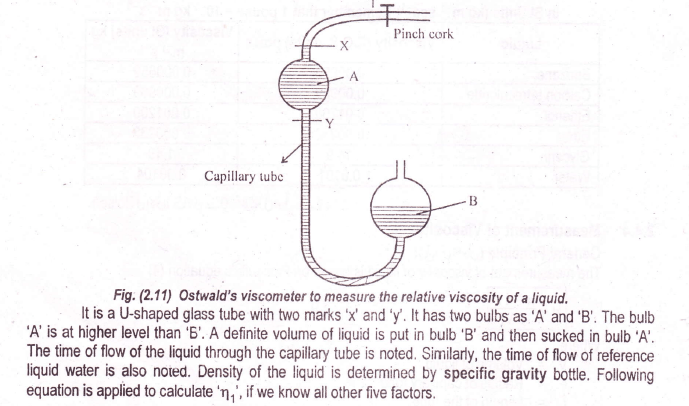 In order to understand the viscosity, let us consider the flow of a liquid. The liquid is considered to be arranged in a large number of parallel layers. The layer adjacent to the walls of the tube is stationary. When we move towards the center of the tube, then the velocities of the successive layers go on increasing. When the steady flow is reached then velocity difference between any two layers becomes constant. The force which is required to maintain the steady flow of liquid in direction of the force is directly proportional to the velocity gradient which is normal to the direction of flow. It is also proportional to the area of the contact ‘A’ between the moving layers of the liquids. In C.G.S system, the unit of “ŋ” is expressed as g cm-1 sec-1 and it is called Poise. “When a force of one dyne per square cm is maintained, between two layers which are 1cm apart and the difference of velocity between the two layers is 1 cm per second, then it is called poise”. The units of fluidity are reciprocal of viscosity i.e. (Poise)-1. The increase of temperature increases the kinetic energy of molecules of liquids. It means that a liquid starts flowing faster at high temperatures. In other words, a viscosity of a liquid falls with the increase in temperature. It is estimated that for each one-degree rise in temperature, there is 2% decrease of viscosity. 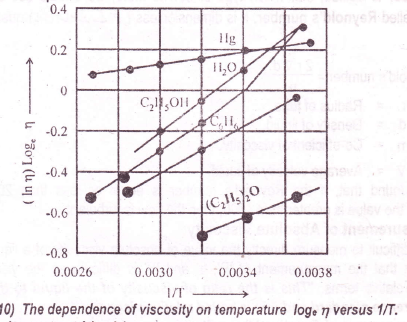 Arrhenius has given the following relationship between viscosity and temperature. A and B are the constants depending upon the nature of the liquid. According to this equation, an increase of temperature decreases the viscosities of liquids. If we plot a graph between 1/T on the x-axis and loge 17 (in ŋ) on the y-axis, then a straight line is obtained. From the slope of the straight line ‘B’ can be calculated and from the intercept of the straight line factor, ‘A’ can be calculated. The following graphs show that many of liquids show the straight lines. The anomalous behavior of H2O is seen from the graph because its hydrogen bonded structure is broken with the rise in temperature. The quantity ‘B’ is the activation of energy for- the viscous flow. It is the energy barrier which must be overcome before the flow can occur. It means that a molecule of a liquid should gain sufficient energy to push aside the surrounding molecules before it can take part in the liquid flow. Remember that 1 pouse = 10-1 kg m-1s-1. V = Volume of liquid. I = Length of the tube. t = Time of flow in seconds. We should keep it in mind that, equation (4) applies to the liquids when the rate of flow is slow and steady. The flow should be streamlined. Moreover, the diameter of the tube should be very small. If the flow rate is higher and the diameter of the tube is large, then flow becomes turbulent. In order to decide, that which type of flow is there, we should use the empirical equation called Reynold’s number. It is the dimensionless quantity and its formula is as follows. r = Radius of the tube. d = Density of liquid. 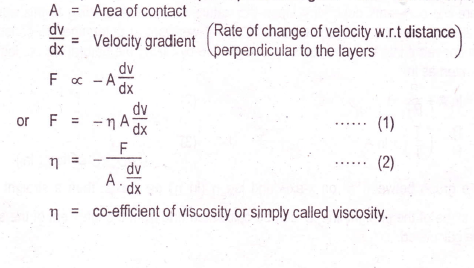 V = Average velocity of the liquid. It is found that if Reynold’s number is equal to or less than 2000, then the flow is streamlined. If the value is greater than 4000, then the flow is turbulent. Similarly, the time of flow of reference liquid water is also noted. The density of the liquid is determined by specific gravity bottle. Following equation is applied to calculate “ŋ1” if we know all other five factors. 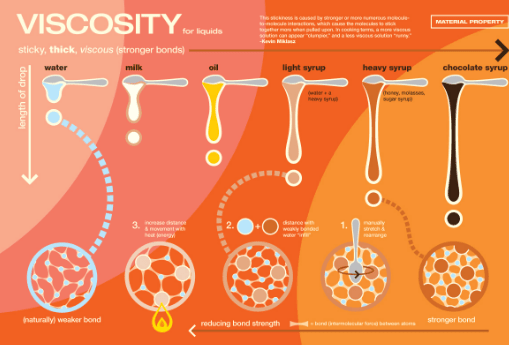 Viscosity surely depends upon the structure of the compound. Following various aspects are very important to be considered. In homologous series of organic compounds, the members differ from each other by- CH2 group. It has been observed that there is a gradual increase of viscosity values for the members of homologous series. Some of the liquids are associated and so their viscosities Dunston in 1909, gave a useful relationship. For the associated liquids, the values come out to very higher than 60. If d, M, and ŋ are measured in C.G.S. units, the following equation is used. Following Table shows that water, glycol, and glycerol are associated with liquids. It also depends upon the shape of the molecules. If the chain length of the molecule is shorter, the viscosity is less. The compounds of normal chain length have usually greater viscosity values than branched chain Similarly, the viscosities of Tran’s isomers are greater than cis-isomers. The strength of intermolecular forces can also be depicted from the Values of viscosity. Just like the parachor of liquid, a parameter called Rheochor is also additive and constitutive property. It depends upon the viscosity of the liquid. 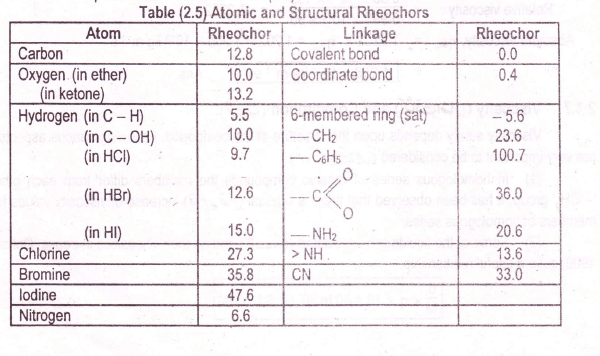 We can verify the structure of the compound by comparing theoretical and experimental Rheochors Table. Molar masses of polymers are very high. It depends upon the reaction conditions whether the molar mass of the polymer is high or low. The measurement of viscosity of solutions of polymers can help us to find the molar masses of polymers. a = Factor depending upon the shape of the molecule. Intrinsic viscosity is a limiting viscosity number when the concentration of the polymer solution approaches zero. A graph is plotted between concentrations of various solutions on the x-axis and ŋsp/C on y­ axis. A straight line is obtained. This graph is extrapolated to the limiting value when c 0. The value of 11sp/C having the value at that stage is called ŋintrinsic.